Savannah Bee Royal Jelly Body Butter Review : Ingredients, Side Effects, Detailed Review And More. What Is Savannah Bee Jelly Body Butter? As per the manufacture Savannah Bee Royal Jelly Bodybutter, US$ 26.90 for 6.7 oz., made primarily from honey and associated ingredients royal jelly, beeswax and propolis, is one of the safest, toxic-free skincare formulations that you can easily access online and in stores. Although it contains fragrance which may lead to skin irritation. The manufacture states Honey is one of the strongest humectants freely available in nature. It has natural antiseptic and anti-inflammatory properties as well. This product is also made with Royal Jelly — the only kind that’s fit for the Queen Bee, and which makes her live for up to 5 years compared to the average bee worker which only lives for 8 months. Savannah Bee Royal Jelly Bodybutter now comes in three varieties: Original, Graceful and Calming Sensitive Skin Formula, and Fresh and Pure Tupelo Honey Formula. What Are The INGREDIENTS In Savannah Bee Jelly Body Butter? Honey: Cleanses the surface of the skin and the pores. Honey has natural antiseptic properties and a powerful humectant at the same time. Propolis: Consists of Vitamin A and B-vitamins, and antioxidants that boost the protective shield of the skin as it also aids the skin in fighting off infections. Organic Aloe Vera Leaf Juice: It reduce skin inflammation. Aloe is used to effectively heal chronic skin problems, such as psoriasis, acne and eczema. Although it may also cause rashes on the skin & itchy skin. It is highly recommended that Savannah Bee Royal Jelly Bodybutter be applied on skin right after a shower, day and night, to immediately seal in moisture and keep it from escaping. Newly washed skin is also easier for product ingredients to penetrate. Apply generously on skin and help ingredients to seep in deeply by massaging onto skin. To facilitate faster healing of dry and calloused skin, apply a generous amount of Savannah Bee Royal Jelly Bodybutter on affected skin and cover with cloth. If it’s on your foot, wear socks for faster healing. This product is best used with the Savannah Bee Honey Body Wash. Provides simple, natural formula for the improvement of dry skin and irritations associated with it. Although it may cause certain skin allergies. The product has a unpleasant smell. It may lead to skin allergies. 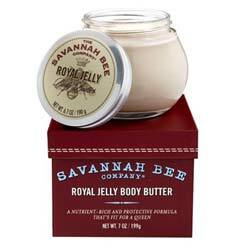 Savannah Bee Royal Jelly Bodybutter can moisturize skin with the use of honey. The skin can be very uncooperative and demanding, most especially if you’re working against it. Your skin needs a little bit more care and attention which can be offered by known products that offer the same benefits like this one. Proper application of this body butter should be observed and tested first on a patch of skin to ensure that there will be no allergic reaction to its main ingredient – honey. There are reported incidents that honey can cause contact dermatitis or hives. Facial moisturizing products are in no short supply today, and this large selection might make the process of choosing the best moisturizer for your personal needs to seem a bit overwhelming. Fortunately, we’ve taken the time to research each of the top facial moisturizers on how they rate in several different key categories. More specifically, we believe that every quality moisturizer should provide the basic benefit of improving overall facial skin appearance, including both skin tone and skin texture. Additionally, a quality moisturizer should contain compounds that are capable of binding to collagen fibres in order to provide the most long term results. Finally, facial moisturizers should ideally be able to deeply cleanse skin at the same time that they moisturize it. Below is a summary of our findings regarding the top facial moisturizers and these key considerations.